Justice League #12 Review – AiPT! 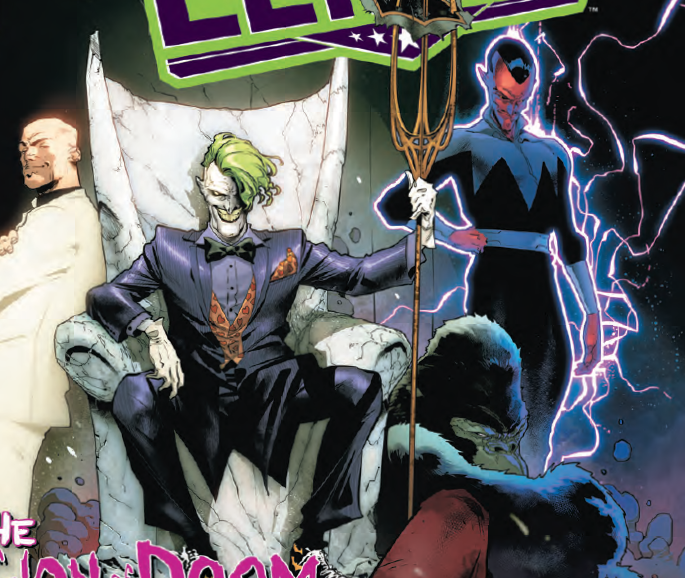 The Legion of Doom takes over Justice League this week and that means James Tynion IV also takes over on writing. The villains are getting the spotlight as we learn more about their involvement in the “Drowned Earth” storyline. “DROWNED EARTH” part three! It’s Batman, in a full-body cast, versus the Legion of Doom! Get a ringside seat for the craziest fight in comics as a bedridden Batman battles The Joker, Lex Luthor, Gorilla Grodd and Sinestro! Meanwhile, Aquaman locks tridents with Poseidon and Mera discovers an ancient secret that could change the fate of Atlantis–and the entire Earth–forever! I want to give a heads up to read Aquaman #42 before reading this one. Aquaman’s struggle that ended Part 2 is explained in Aquaman #42 and is lost completely if you skip it. That said, this issue progresses the storyline nicely in the event and should keep fan son their toes. I continue to marvel at how Scott Snyder and Tynion IV keep stuffing this series with content. This issue contains a backstory for Black Manta that strengthens the character while also progressing the plot of the main story nicely. This issue also further develops Poseidon’s role in the event and how he made a big mistake many years prior to the events here. This adds a lot of context to the story personally (for Black Manta) but also plot-wise too. This issue also juggles a very angry Batman in a mech suit and an incredibly heroic moment for Mera. All told there’s once again a lot of bang for your buck with this series. Tynion IV is aided by the talents of Frazer Irving and Bruno Redondo who both bring their A-game. Irving dazzles with his imagery, giving the Poseidon scenes an otherworldly look and feel that helps establish how incredible these battle of the gods are. He also draws scenes in the now which heighten the dramatic boldness of Mera as she continues to show she’s one of the strongest Justice League members ever. Frazer’s rendering of Flash looks positively gross with his fish-disease slowly manifesting. Redondo draws much of the Batman-mech scenes which make him look formidable, angry, and huge. He dabbles with the flashbacks to revealing Poseidon and his terrible choices giving these scenes a mythical feel that’s larger than life. The tide (heh) turns in this issue, but that turn feels slighted somehow. It may be the art — mixing two styles can reduce the coherence — but it’s more so how quickly we learn of the powers of evil and light that in play. I basically understand how things turn badly for the bad guys, but they turn so quickly and seem so weak in their ability to lead it’s somewhat unearned given how much they were built up in previous chapters. Up until this point, the bad guys were all-powerful and without a failing, but quickly their frailty is revealed here. As far as event comics go this issue progresses things very nicely. There’s no decompression, but instead a wealth of entertaining scenes and plot-progressing moments. This is the speed events should always move in. That said, the villains turn tail in a way that is somewhat unearned.